"Noise masking" refers to any device that produces a white noise sound to prevent someone from hearing voices or other sounds in the environment. Millions of people sleep with a fan at night because it drowns out snoring and other sounds. Noise masking is completely natural and harmless, but just as it may take you a couple of nights to get used to the fan running, we similarly recommend that you try your white noise machine on a low setting at first, increasing the volume a little at a time each night so you can have some time to adjust to this change in your environment. Once you are accustomed to white noise, you may find it hard to sleep without it. Noise masking is a solution for business environments too, when you need to protect the confidentiality of conversations. Just remember to put the masking sound in the area where the listeners are - not where the conversation is taking place. Qt™ ceiling mounted systems for open cubicle spaces over 500 square feet in area, and for installations in which treatment of 4 or more offices is desired. Sonet QT™ is the only system designed specifically to treat cubicle spaces. Sonet is also ideal for high-wall cubicles, small offices, waiting rooms, treatment rooms and hallways, as well as bedrooms and home offices. 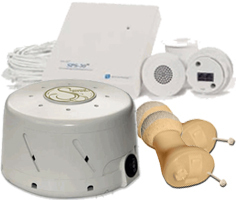 Noise masking devices, also referred to as white noise machines, sound therapy devices, speech privacy systems and white noise CDs, all work on the same principles. Noise masking helps in two ways: first, the presence of the sound in your environment causes your hearing to be less acute. In an extremely quiet house, you can hear water dripping in the bathroom 50 feet away. Add just a little sound to the environment and you can no longer hear the drips. The second way that noise masking works is by being louder than the noise that was bothering you. For that to be effective, the masking sound must be less bothersome than is the bothersome noise. For this reason, we recommend more expensive solutions. Cheap white noise machines use short digital loops that quickly become irritating. More expensive machines use well engineered longer loops that make their sounds appear to be completely random, and which are therefore, much less likely to irritate the listener. Just remember that to block out sound with noise masking, you need your white noise source to be next to you -- not next to the sound you're trying to block out. The closer the masking sound is to your ear, the more effective it will be. This is why the most extreme noise masking devices available actually fit inside the ear canal! Questions? Comments? Email us: - we are here to help.